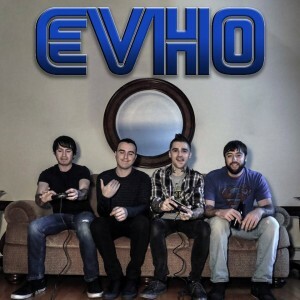 Formerly known as Even Horizon, EVHO is a 4 piece band from New York that sports elements of pop, alternative, progressive, and a touch of psychedelic. With all those things combined we are presented with “From The Sun“, a 5 track EP that shows much promise. Each track features a mainstay alternative style that doesn’t overplay it’s role and allows for all the other musical styles to texture themselves in and create a really padded and fulfilled listening experience of Rock n Roll. From The Sun being the title track and lead single from the album is heavy on the psychedelic element as the guitars are often phrased with echoey and wavey pedals that let notes either sustain or delay in a fashion that plays into vocalist John Clark’s harmonies and high pitch voice. Black Cat Walk is a fun and interesting track that shows off more high pitched vocals and a more punk and pop vibe on instruments as the song sounds more upbeat and structured in a fashion of The Atari’s or Yellowcard if you need a good reference material to attribute to this song. Taking a break from song analyzing, EVHO is consisted of 4 friends who have known one another for nearly 2 decades and have toured and recorded together for 8 years now. 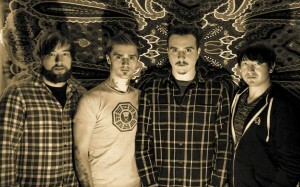 A dynamic of a band with that much time together can surely contribute to the sound even more. As a whole, From The Sun is a very promising album for a band rebranding and a strong foot forward to show fans of Mars Volta, Circa Survive, Pink Floyd, and even Soundgarden fans that music never forgets it’s roots or motivations. So there is much to check out and enjoy from EVHO from their previous material to whatever the future has in store. Mea Culpa is a song I want to bring out in this review for many reasons. The above mentioned references of music history strongly apply to this song as we see a great deal of progressive atmosphere and that Pink Floyd trippiness in the guitar effects and the grunge tones of the drumming as the song all around gives me that 90s vibe and tuneage that really brings the music experience of nostalgia as a listener and someone who grew up through the 90s with the sound. That being said a fun little fact is that Mea Culpa is a Latin phrase that means “Through my fault” or translated to the idea of acknowledging one’s faults. With that knowledge in mind it certain gives the song a theme and context to take away. Answers is a candid look lyrically into getting what need over what we want. It definitely gives the thought of hearing hard truths and possibly the idea of where to go after hearing them. With the acoustics underneath the vocals this song is a somber entry and wrap up to an amazing 5 song experience from a band that shows much maturity and promise. Authors note: From the Sun by EVHO is a promising entry and first foot forward for a band that provides many old school elements of music and paints a bit of modern songwriting take on things. From the Sun by EVHO provides songs for fans of alternative 90s and indie fans as it can be loud or soft, rock or acoustic. There should be a song for any music lover as there are only 5 songs that combine the best of this band and lays the foundation of what to expect next. Album Review, Alternative, Contrast CTRL, EVHO, From the sun, Rock. Bookmark.